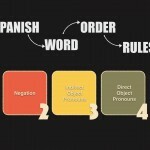 If you’re learning Spanish, there are a few simple rules that can quickly help you improve your pronunciation and start sounding more like a native speaker. 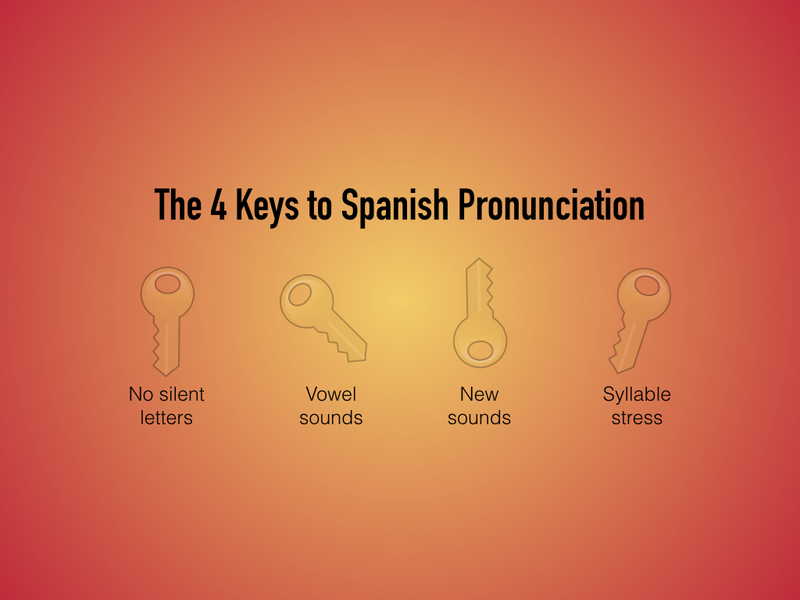 These 4 fundamental aspects of Spanish pronunciation can be quickly applied in situations where you’re not sure how something is said or if you’re making pronunciation mistakes. Luckily in Spanish, what you see is what you get. So just remember to pronounce every letter you see. This is an advantage Spanish has over other romance languages like French. There are no silent letters (with the exception of the Spanish ‘h’ at the beginning of a word). But there is no silent ‘e‘ as in English or silent ‘ent’ as in French. Listen to the Spanish pronunciation of the phrase below, spoken by Maider a native Spanish speaker. Note the pronunciation of each letter. Listen again and note the sounds for ‘e’ and ‘i’. English speakers often make mistakes with the Spanish ‘i’, as it sounds more like the English ‘ee’ and the Spanish ‘e’ sounds like the English ‘ay’. It’s always good to be aware of your propensity for possibly mixing up the sounds. Stay tuned for our future post on Spanish vowels sounds in more detail and diphthongs. Before you start a new language, you should learn which sounds are entirely new to you. For English speakers, there are only 2 significantly different sounds in Spanish, that have no English counterpart, which make them more difficult to pronounce. These are the Spanish ‘j’/’g’ sound and the trill double ‘r’ sound. The remainder of the consonant sounds are generally similar, with a few smaller exceptions which we’ll also address in a later post. Listen to the following audio examples of the Spanish j,g and double r sounds. Try to mimic them so your pronunciation of these sounds similar to the native speaker. The more you practice, the more it will become second nature for you. This is a throat sound which is similar to a noise you might make to imitate and animal hissing at you with their throat. This sound is used with the ‘j’ as well as the ‘g’, but when the ‘g’ is followed by an ‘e ‘or an ‘i’ as in ‘gerund’ or ‘girafa’. Note the ‘g’ not followed by ‘e’ or ‘i’, is the same ‘g’ as in English, as in the word ‘garden’. Many English speakers struggle with this sound. Try starting with the American English version of the word ‘butter’. The sound you make for the two ‘t’s together is actually the same as the Spanish ‘r’ sound in the singular. The double ‘r’ trill is just a stronger version of this same sound. And remember, you don’t have to overdo it! One quick (and essential) key to speaking correctly is to use the correct word emphasis. This can improve your ability to be understood by native speakers dramatically. And in Spanish it is especially important because English tends to have exactly the opposite pronunciation emphasis. 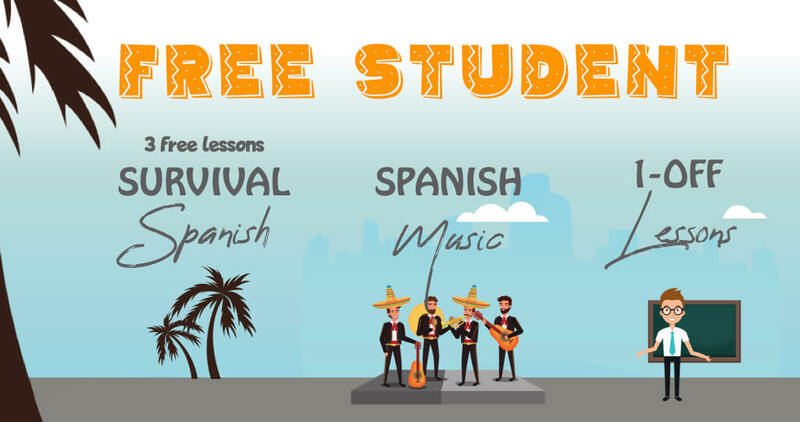 In Spanish, 2-3 sylable words (without written accents) generally put the stress on the last or second to last syllable, while in English it’s typically on the first. When you see an accent in Spanish however, this tells you to put the emphasis on the syllable with the accent. Consider the following words which are the same in English and Spanish, but have different pronunciations and stress. Note where you normally put the stress in English. Then note the difference in placement of the stress for the same word in Spanish. Say them out loud and feel the difference for yourself. 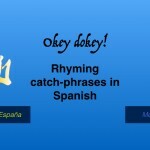 Find a written Spanish dialog with an accompanying audio. You can find your own or use the example below. First read the dialog aloud, then read along in your head with the audio. Continue practicing reading aloud and listening to the audio until you are familiar with how each word is suppose to sound and you can read it without any pronunciation mistakes. Estaba aquí pensando en cuando era pequeña, y bueno, mi vida era un poquito diferente porque ahora vivo en la ciudad, pero cuando tenía diez años vivía en un pueblo, a las afueras de Barcelona. Y vivíamos todos juntos, mis padres, mi hermano y mis abuelos, en una casa de tres pisos, muy bonita. Era una casa muy bonita.